The latest commit of chosen branch. The commit of chosen tag. Any commit, you click ... to launch log dialog to choose commit. You also can input commit hash, or friendly commit name, such as HEAD~4. You can find more information at the section called “git-archive(1)”. The export dialog does not allow exporting single files. 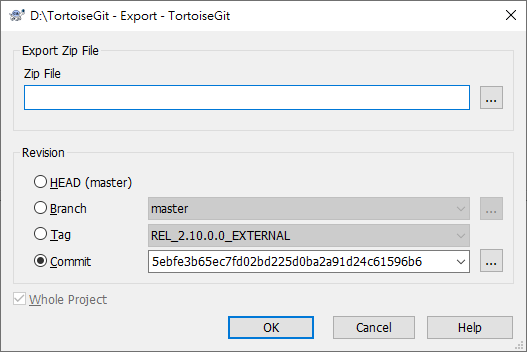 To export single files with TortoiseGit, you have to use the repository browser (cf. the section called “The Repository Browser”) or log dialog (cf. the section called “Log Dialog”). Simply drag the file(s) you want to export from the repository browser to where you want them in the explorer, or use the context menu in the repository browser to export the files.